The recent launch of Sony’s PS4 has spawned an announcement of new, compatible headsets from Creative. They include the Sound Blaster Evo series and Sound Blaster Tactic3D Fury and Rage USB. Creative’s Evo ZXR is the most expensive and powerful of the range, sporting a SB-Axx1 sound chip for enhancing sound quality, as well as 50mm drivers for providing impressive sound reproduction. It currently sells for £249.99. The Evo ZX, which is an on-ear headset sporting 40mm drivers, is the little brother of the ZXR. It too comes with a SB-Axx1 chip, which, as already mentioned, has been implemented for making sure that the overall sound quality is amazing. It’s £50 cheaper at £199.99. 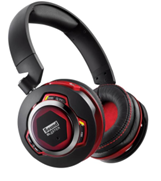 The new Sound Blaster Tactic3D Fury is the most distinctive design of the whole Tactic3D series. It has been provided with built-in 40mm FullSpectrum drivers that deliver an impressive sound experience, which also happens to be nicely balanced. It’s decently priced at £59.99. Both ranges can be found over at the official Creative UK website.